Symphony Location Manager is a product that allows you to manage your spatial data and proactively inform people within your organisation or outside, of any changes that are important for them to know and respond to. What are the Benefits of Symphony Location Manager? Managing Spatial Data can be difficult, but with Symphony Location Manager you can manage and share your spatial data with ease. This can lead to more informed decisions within your organisation, saving time and money and improving the services your organisation provides. It ensures the widest possible audience by making your data available on mobile devices in an easy to understand and innovative way. Symphony Location Manager forms an ideal extension to your existing GIS. Symphony Location Manager is a product that allows you to manage spatial data. It allows you to proactively inform people within or outside your organisation of changes to streets, properties or any other spatial data that are important for them to know and respond to. You can do this without having to remember or expend valuable time and effort repeating this task. This minimises your workload, whilst maximising the benefit to your organisation, leading to more efficient and cost effective services. Its management capability also helps implement practical strategies for dealing with data protection legislation such as GDPR. The widest possible audience for this information is enabled by allowing this information to be viewed on mobile devices such as smartphones. Symphony Location Manager can further enhanced this by allowing the information to viewed in augmented reality, making it easier and faster to understand and act upon. Symphony Location Manager has been designed to be a one stop hub to help you manage spatial data. It includes features designed to aid the loading of spatial data, merging and filtering it and then publishing it in multiple formats including those compatible with your GIS . It enables any of this data to be represented on mobile devices and in augmented reality for easier visualisation, understanding and interrogation by people outside the office. It has the ability to load and publish spatial data in multiple formats. Both loading and publishing can be scheduled, saving time and money whilst ensuring maximum efficiency. It can join and filter data to make it an extremely powerful tool for managing and combining spatial information. It can publish spatial data in multiple formats enabling access to the widest possible audience. Non spatial data with a UPRN can also be loaded and merged to produce a mapping output. Spatial data that contains personal information falls under the remit of GDPR. 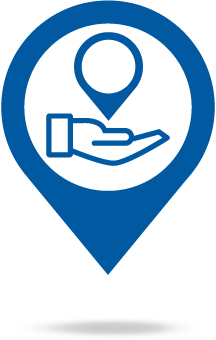 Location Manager is compliant with this directive and can help an organisation meet its obligations. Location Manager can also make any spatial information it manages available to mobile devices via an app that can also represent this data in augmented reality. It can load spatial data in different file formats and also directly from different database types using open source technology. This can also be automated via an in built scheduler. Symphony Location Manager can load spatial data in two ways. It can either load data directly from a spatial database such as Microsoft SQL Server, Oracle or Postgres. Or it can load spatial data from ESRI Shape or MapInfo Tab files. Loading of data from a database or from a file can be automated using an built in scheduler, the frequency of load can be configured by the user. It can be used to combine spatial data from multiple sources to enrich and bring new insights to the data available. This can also be formatted and filtered for a specific audience. The built in view builder enables a user to combine spatial data from one or more files or databases. The views can be used to both format and filter data by a user to ensure the data is completely relevant for the final recipient of the data. The view builder has a simple wizard driven mapping mode as well as an advanced mode where complex views can be configured using SQL. A user can also create more views on existing views they have created for maximum flexibility and power. It allows spatial data held to be sent to those who need access to it via their preferred means of communication. This can be undertaken when it suits them and organised to suit their business need. Any data held can be sent to a recipient in a varietry of GIS formats including ESRI Shape, MapInfo Tab or CSV format according to their preference. This can be sent via email, FTP or to a network folder location. It can be automated via our built in scheduler, the frequency of which can be set by the user. The same data can be sent to multiple recipients each of who can have a different preferred communication method and different frequency. Any data that is published can be split by a field of the users choice to make it easy to consume and relevant to a recipient. If your spatial data contains personal content, you will need to ensure that your handling of it is compliant with GDPR. Sympony Location Manager has features that help you meet this requirement. GDPR requires that you must be able to delete and /or anonymise personal data. It also requires you to implement a data retention strategy if relevant. Although most of your existing systems will be able to fulfil the first two requirements, a lot will not have an in-built retention period feature. Symphony Location Manager does and can help your organisation comply with this regulation. It allows any spatial data it stores to be viewed on a mobile device such as a smart phone and in augmented reality. It allows you to choose the data, determine the visual representation, restrict devices and control security. Proximity based banner ad capability on the mobile app is also available. Location Manager comes with a set of web services that allow you to view any of its spatial data on a smartphone, tablet or smart glasses. This data can be viewed in a traditional 2D map and as augmented reality images. Please see Symphony AR for more details on augmented reality. It allows you to manage the devices that have access to the data and the security grouping to determine what data can be seen. Proximity and time based banner ads to be displayed on the mobile devices can also configured by the user. If you’ve got a question about how you can manage spatial data or would like to get a quote to use Symphony Location Manager within your organisation, contact us using the form in the Find Out More Section below. Symphony AR is an Augmented Reality application that provides its users visual, real time data relevant to their current location and circumstance. Well suited to front-line Emergency Services and Local Government staff, it facilitates the access of important information to better safeguard staff and the public. Hard Disk – 10Gb minimum of hard disk. Most of the data will be held within the database on the Database Server. Monitor – Resolution 1280 by 1024 pixels; 19″ CRT monitor or larger with .26 dot pitch (capable of 1600×1200 at 75 Hz) or 17″ or larger digital LCD panel. Graphics Card – The machine should have a video card with 128Mb+ dedicated video RAM. RAM – 16Gb – however it is recommended that you have more RAM for the operating system. Hard disk – SCSI / SAS hard drives in Performance RAID configuration with sufficient storage space for your Symphony Location Manager database including suitable backup contingency strategies.